I love the idea of building people or robots and an underground city full of them sounds very cool indeed. This could certainly work in well with the inventor, creator side of Maker Spaces. Perhaps after reading the book to a class children could create their own robots out of things lying around the house. I will definitely be looking forward to this book. How many of you had to share a room when you were little? Well this delightful board book is bound to bring back memories of those shared spaces. 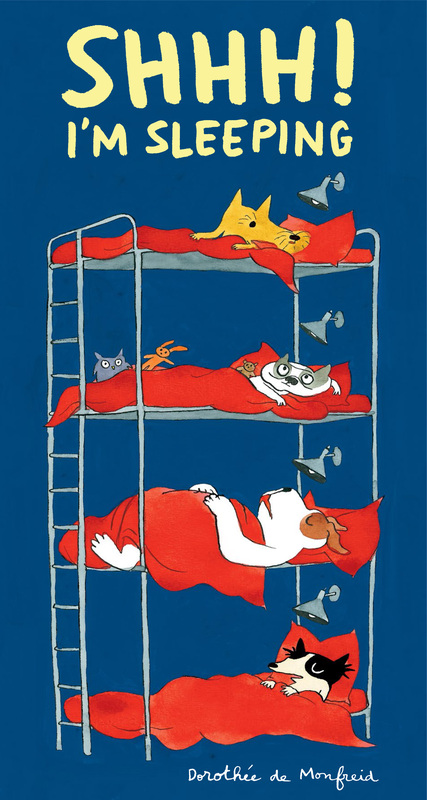 In this case there are eight dogs who were all sleeping soundly until Popov starts snoring. One by one they wake up and begin wanting other things to do. Drinks of water, stories and even a change of bed or two keep the young dogs up, well except of course Popov who has no idea his snoring is causing so much trouble. I love how the illustrations start with just the dark shadows but as each lamp is turned on the characters begin to shine. The dogs are delightful and so familiar. Reminiscent of sleepovers where no one would get much sleep at all. I don’t think it matters what age of child you read this book to, as the story is a familiar one and has such a lovely warm feeling to it that it will bring out a smile from anyone. I think the illustrations capture the experience perfectly. Gorgeous! 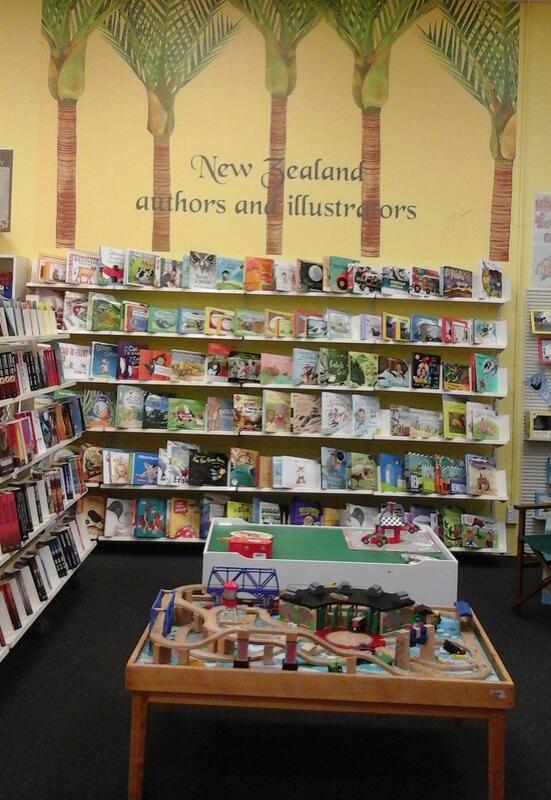 With the first ever New Zealand Bookshop day fast approaching, I thought I would take this opportunity to ask the new owner of my favourite bookshop, The Original Children’s bookshop, a few questions about books and bookselling. Please tell us about how you recently bought the shop but have been involved with it for many years. I have not long bought The Children’s Bookshop – now The Original Children’s Bookshop. I have worked here for 30 years and thought that it was time to give owning it a go and to try some of my ideas. What is your favourite thing about the shop? The books! I love seeing all the new titles arrive and sharing my favourites with other people is just such a buzz. Hearing about what customers have been reading and are getting enthusiastic about is great. What does your shop do that makes it so special? The range of stock that we have and the knowledge we have about it is pretty special. We try to read as many of the new titles as we can so that we can personally recommend them to people. We never forget about the old favourites either. To us bookselling is not just a means of making a living, it’s more about introducing new generations to the delights of some of the old favourite stories and discovering new stories and authors. Why specialise in children’s books? Maybe I’ve never really grown up. I probably enjoy a lot of children’s books more than “adult” literature. More though, I think it’s because I really value reading and the knowledge and experience it can bring to the reader, and this is my way of helping nurture new generations of readers. Well, it depends on my mood. I like science fiction, but I love a good adventure story, especially with a touch of magic – like The History Keepers series by D. Dibben or The Billionaire’s Curse series by R. Newsome. Some of the teenage books are superb, especially the ones the deal with “issues” but are not all lovey-dovey. When I’m pretending to be an adult, you can usually find me with my nose in a crime novel or thriller, but I also like Dickens and Jane Austen. I could keep going, but that would be plain boring. The shop is in Blenheim Square, 227 Blenheim Rd, Christchurch. That’s the block of shops with the massive carpark and The Mad Butcher, United Video and Couplands. We are tucked in the corner beside The Warehouse Stationery. 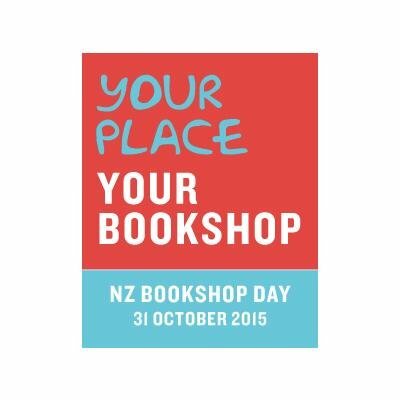 This is the first NZ bookshop day – why get involved? One. Because it will be fun. Two. Because bookshops in New Zealand need your support. We know that there are lots of places out there where you can buy your books, but many of them don’t support the local community by giving discounts to schools and preschools, or prizes for raffles etc. as we do. We want to celebrate you, our customers, and we want you to celebrate us as members of your community. And, most of all, we want to keep sharing our favourite books with you. Oh, I nearly forgot. Three. There are some neat prizes to win. Thank you, Mary for sharing your thoughts. I have been involved with the bookshop myself for about 8 years and it was incredibly heart-breaking to see it so damaged after the February 2011 earthquakes that it had to be demolished. It really is wonderful to see it back on its feet and thriving. I know they have special plans for Saturday 31 October and I will be there to have some of that fun. Do come along and spend time with local children’s book illustrators Jenny Cooper and Helen Taylor. They will do book signings, they may read and will probably draw. Jenny will be here from 11-2 and Helen 12-3. Zac McCallum from the City Libraries is coming in at 2.30 and doing a storytime. Check out the photos below. They have a New Zealand author section, which is incidentally, where I had my own book launch and they were wonderful hosts and made my night so special. There are some great books to choose from on NZ Bookshop day supporting NZ authors and illustrators. 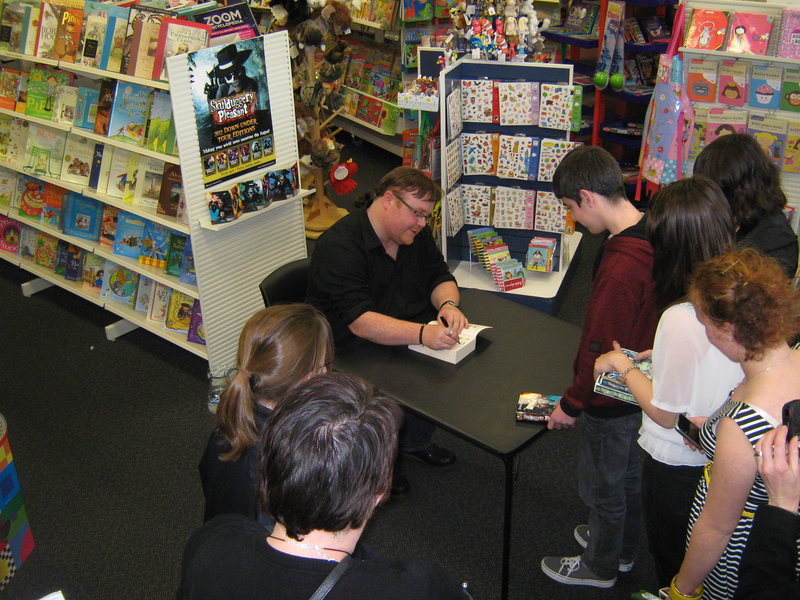 There is a cool photo of author Derek Landy of Skullduggery fame here signing books during a visit to the bookshop. 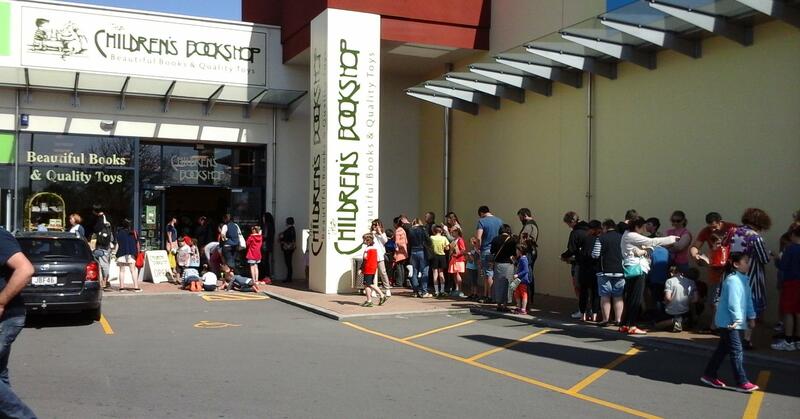 Also take a look at the queue of people waiting just a few weeks ago to get their books signed by author Andy Griffiths. It really is a special place to visit but if you can’t make it in you can always visit the shop online here. 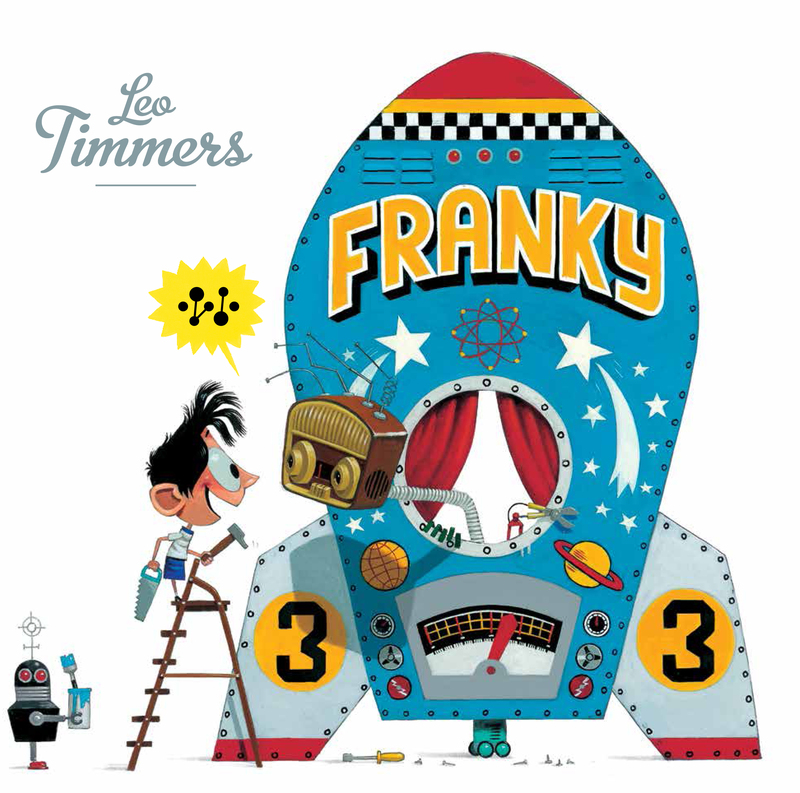 Leo Timmers is an award winning writer and illustrator and with his latest book Franky it is not hard to see why. This will surely be another winner. Timmers illustrations are quite detailed with heaps to ponder over but not too busy as to be a distraction. The colours are bright and bold and just perfect for young readers. Franky and Sam have the most delightful facial expressions where their personalities shine through. Not always easy to do in children’s picture books but here Timmers does it brilliantly. This is a fun read about robots, imagination and creativity and holding on to your beliefs even when no one believes you. A great wee read for pre-school children but I can also see this picture book being used in schools, particularly in junior classes, as part of the new makerspace programs. Makerspace activities have much to do with science, technology, engineering and maths (STEM) and this delightful book has Sam doing all that. Sam thinks about what he wants, uses items around the house, and then with determination, creates his robot. What happens to the robot – well – you just need to get hold of the book. It is bound to become a firm favourite with young ones. First thing this morning I picked up my copy of this book and I have done nothing else but paw over the pages. Wow! Double wow! It is simply awesome. This is the same wonderful, magical story we know and love but vividly illustrated in how I can only describe, as stunning. It is beautifully packaged in hardback and the end pages alone are so hauntingly beautiful that it took me ages to turn to the next page, as I was totally mesmerized by the art work. The pages depicting Diagon Alley are just perfect with their crooked and disheveled shops. I so want to go shopping there and walk the same streets. Harry’s loneliness is captured so vividly that you can’t help but be moved by his total vulnerability. Love it. Draws you right in to Harry’s world. It is a beautiful spring day here in Christchurch, New Zealand with temperatures heading towards 27 degrees C. I need to get in to my garden but I really can not move. I just want to sit here and read this over and over. It really is a stunning book and one that I am sure will not only fly off shop shelves but it will become a firm favourite and a treasured and much-loved book for so many readers. For those who already love Harry, Hermione and Ron, this is gorgeous. For those who have yet to meet Harry, this is the way to do it. 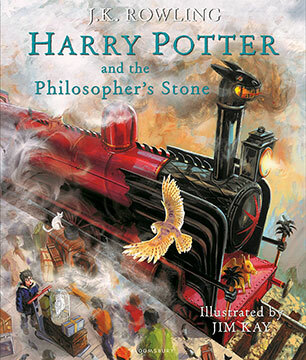 Hop on board the Hogwarts train to a magical world of make-believe. Jim Kay discusses his pictures here. This book ticks lots of boxes and is ideal for parents and teachers to share with children. It is a large, portrait sized hardback picture book which tells the story of a land where greedy rulers have caused havoc and forced their people to hide in fear, shrunken away almost into oblivion. Even all the blue birds are caught and kept in cages because the rulers demand their capture and imprisonment. Life is harsh under the rulers might. 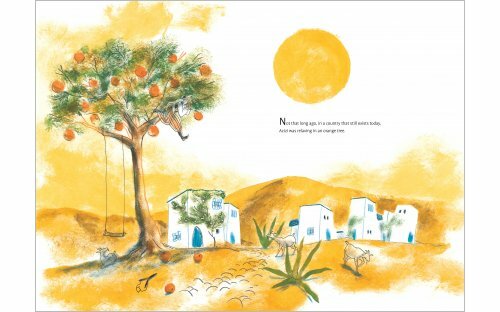 The land is hot and dry and the illustrator’s choice of burnt orange and yellows reflects this perfectly. I also love the pictures with the jasmine and in this large format, it seems as if the jasmine is indeed climbing the walls and blooming everywhere. Azizi lives in a country governed by greedy rulers, who capture all blue birds and lock them up in a big cage in the courtyard of their palace. The people suffer and live in fear, until one day a little blue bird escapes from the cage. Together with Azizi it sets out on a long journey to free the people of their cruel and relentless rulers. The story unfolds in a fable-like way so that readers can see the consequences of greed but also when one little bird escapes, they also see how one thing, or one person can make a difference. It only takes one person or in this case, one bird to stand up and say enough! One person can take the first step to make change happen. 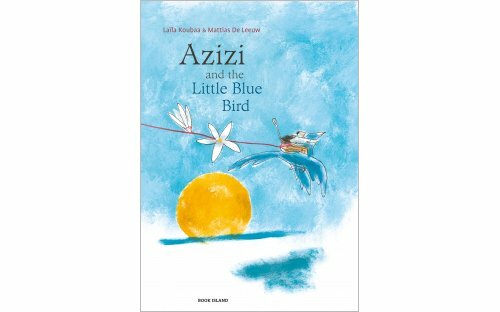 Greed, arrogance and even bullying all play a part in this story but it is also simply a story to enjoy especially when Azizi finds friendship and then hope with a little blue bird. It is also great to see a story set in another time and place and bringing in cultrually diverse characters, which is so important for young readers today, given how connected we all are now. For teachers there are some great notes here to make the most of this story. Definitely one to add to your school library collection. 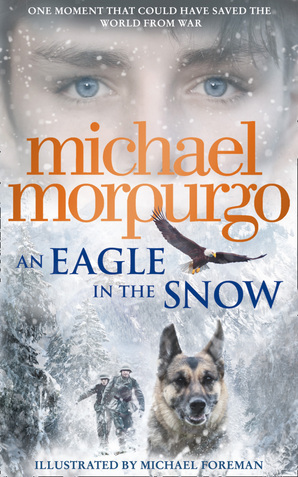 Definitely one for young adult audiences/readers. If you are after a good scary story with heaps of blood and gore then this might just be the one for you. Not for the faint-hearted, I imagine. Well the end of the trailer certainly scared me! And don’t read it at night just before you turn off the light unless you want nightmares. Oh my goodness – this is just delightful. Mo Willems himself in a book trailer cooking slop – really yucky slop. The kind of slop that would make you gag! I love Piggie and Elephant books and adore their unique and quirky relationship which is full of humour and kindess. There really isn’t much I can say as I think Mo himself does it so well but will Gerald be tempted to eat Piggie’s cooking? I guess I will have to wait like everyone else until the end of October. Do check out Mo Willems website. It has heaps to look at and heaps of fun to do especially the GoMo page.